No account of my childhood would be complete without mentioning the eunuchs. They waited on me when I ate, dressed and slept; they accompanied me on my walks and to my lessons; they told me stories; and had rewards and beatings from me, but they never left my presence. They were my slaves; and they were my earliest teachers. ww2dbaseOn 12 Feb, Empress Dowager Longyu signed the abdication document on her son's behalf, officially ending the Qing Dynasty, though Puyi was to retain the title of the Xuantong Emperor, was given a stipend of four million silver dollars by the Republic of China (though it was never paid in full), and was allowed to remain in the northern sections of the Forbidden City and to use the Summer Palace. On 1 Jul 1917, the warlord general Zhang Xun took control of Beijing, China, and announced the restoration of Xuantong Emperor, but Zhang's attempt was thwarted shortly after, and Puyi was deposed a second time only 12 days after being crowned again. In 1922, he married Wan Rong as his empress and Wen Xiu as the Imperial Shu Concubine. On 5 Nov 1924, he was forced by warlord Feng Yuxiang to officially give up the title of the Xuantong Emperor, and then was expelled from the Forbidden City. The former imperial family moved into the Northern Residence, his father's estate, and then in 1925 he fled into the Japanese controlled area. The Japanese immediately provided him the Quiet Garden Villa in the Japanese-controlled area in city of Tianjin, where he would live until 1932. During his time in Tianjin, his concubine Wen Xiu learned of the western practice of divorce, and pursued such a separation from Puyi. ww2dbaseOn 18 Feb 1932, shortly after the Japanese established the puppet state of Manchukuo in Manchuria, China, Puyi accepted Japan's request for him to rule as the monarch. He officially proclaimed the title of Chief Executive Datong on 16 Sep. 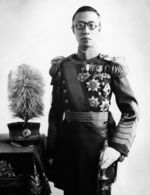 In 1934, he was crowned as Kangde Emperor of Manchukuo. He expressed interest to rename Manchukuo as Qing and to don the traditional Qing imperial robes, but the Japanese rejected his request. He had little choice but to retain the position as the rule of Manchukuo instead of a second Qing Dynasty, but staged a small rebellion against the Japanese by wearing imperial robes at the Altar of Heaven during his coronation. The imperial household of Manchukuo was closely monitored by the Japanese. He was forced to convert to Shintoism and was ordered to declare Shinto the national religion. In 1935, he visited Japan; during that trip, he was extremely courteous to the Japanese imperial family, and he thanked Emperor Showa for allowing clear skies and sunshine at a review he attended. In terms of political powers, his influence was merely nominal, for all the major decisions were made by his Japanese advisors, and the bills he signed into law were nearly all prepared by legislators on the Japanese payroll. ww2dbaseIn 1937, Kangde Emperor took Tan Yuling as the Xiang Concubine; Tan Yuling passed away in 1942 at the young age of 22 with a mysterious illness. In 1943, he took 15-year-old Li Yuqin as the Fu Concubine. ww2dbaseNear the end of WW2, Puyi attempted to escape to Tokyo to surrender to the Americans, but he failed to stayed ahead of the fast moving Soviet front lines. On 16 Aug 1945, he was captured by Soviet troops and was turned over to NKVD operatives; at the same time, SMERSH, another Soviet intelligence directorate, aimed to capture Puyi, but lost the race to NKVD. The Soviets kept him under house arrest in a palace, and he was treated well on Joseph Stalin's orders, largely due to the fact that Stalin thought Puyi might be useful in the future as yet another puppet leader. In 1946, he testified at the International Military Tribunal for the Far East in Tokyo, noting that he resented the Japanese influence in his nation; in his autobiography "The First Half of My Life" published in the 1960s, he would retract his statements made at the tribunal. 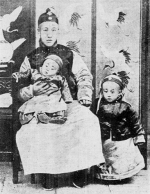 In the same year, 1946, the former Empress Wan Rong died in a Chinese prison. In 1949, as the Chinese communists won the civil war, Puyi wrote a letter to Stalin, requesting that he not be sent back to China; in 1950, however, Stalin sent Puyi to communist China, largely to warm his relations with the new Chinese communist government. He was imprisoned in the Fushun War Criminals Management Center re-education camp in Shenyang, Manchuria, China until 1959 when he was granted amnesty by Mao Zedong. During that time, his concubine Li Yuqin divorced him in 1958. After moving to Beijing, he voiced his support for the communist party, and worked at the Beijing Botanical Gardens. He married Li Shuxian, a nurse, on 30 Apr 1962. In 1964, he worked as an editor for the literary department of the Chinese People's Consultative Conference, becoming a full member of the conference later that year. ww2dbaseIn 1966, the Cultural Revolution began, and Puyi was attacked as an anti-revolutionary. He became shaken, both physically and emotionally, during this period. In 1967, he passed away in Beijing from complications arising from kidney cancer and heart disease. His remains were cremated and placed at the Babaoshan Revolutionary Cemetery alongside of other important political figures. In 1996, his widow Li Shuxian moved Puyi's ashes to the commercial cemetery Eastern Qing Mausoleum in return for monetary support, which was near the Western Qing Tombs where four of the nine Qing emperors preceding Puyi and many other members and relatives of the Qing imperial family were interred. ww2dbaseBased on Manchu tradition, clan names were not used alongside given names, thus references to him as Aisin-Gioro Puyi (or Aixin-Juelo Puyi in Chinese) only appeared after the establishment of the Republic of China in 1911. This longer form of his name originated either as the new republic forced the practice of using last names for all citizens, or as a method to overthrow that particular tradition from the imperial period. Some unofficial histories also referred to him either as Henry or Henry Puyi, which referred to the alleged western name given to him by his tutor Reginald Johnston of Scotland; this western name was only used in rare occasions, all of which involved meetings with westerners between 1920 and 1932. 7 Feb 1906 Puyi was born in at the Prince Chun Mansion, Beijing, China. 1 Mar 1932 Former Chinese Emperor Puyi was declared Chief Executive Datong of the puppet state of Manchukuo in northeastern China. 9 Mar 1932 Puyi was inaugurated as the Chief Executive of the puppet state of Manchukuo in northeastern China. 18 Sep 1940 Emperor Kangde presided over the dedication ceremony of the National Martyr Shrine of Manchukuo in Xinjing, the capital of the puppet state. 16 Aug 1945 Soviets captured Emperor Kangde, puppet emperor of Manchukuo at Xinjing airport (later Changchun Dafangshen Airport) in Xinjing (Changchun), Jilin, China. 17 Oct 1967 Puyi passed away. 1992 movie, " The Last Emperor"